Physics is used throughout the world of medicine and healthcare. At your GP’s surgery you might have come across devices which trace your heart rate or blood pressure simply by clipping to your finger. At the hospital or clinic there’s a vast range of imaging technology to help diagnose and monitor illnesses, along with devices to help treat diseases and tremendous advances in the engineering of prosthetic limbs. A magnetic resonance imaging (MRI) picture of different sections through a human skull. An infrared image showing different circulation patterns in a patients hands. The bright white bits show the warmest areas. This workshop focuses on how we can use different areas of physics to help us see inside the human body without having to go through all that messy “cutting holes in people” business. The first surprise is that we can use light to understand what’s going on with our body’s internals. A pulse oximeter shines both visible red light and infrared light through a thin part of your body (usually your finger) to measure your pulse and the amount of oxygen in your blood. Using a thermal imaging camera, infrared light can also be used to test patients’ circulation or to look for areas of their body which are producing unusual amounts of heat. For those occasions when long wavelength light just won’t cut it, we can bring in the big hitters of the electromagnetic spectrum: X-rays. These can pass straight through soft tissue and out the other side, helpfully giving us rather nice pictures of our skeleton in the process. This is great for looking for broken bones or displaced vertebrae, and X-ray images will be familiar to anyone who’s ever broken anything. Established as X-ray technology might be, it’s not standing still. Computerised Tomography – “CAT scans” – use the tremendous advances in computing power to process slices of X-ray imagery into three-dimensional stacks of images, or even full 3D models. The Institute of Physics have a heap of information on X-ray imaging. Download the teachers’ notes pack and delve in. Yes, even if you’re not a teacher. Go on, nobody will know. Meanwhile: what if we want to look at our heart, lungs or other squishy bits, in more detail than even X-Ray CT scanning can deliver? 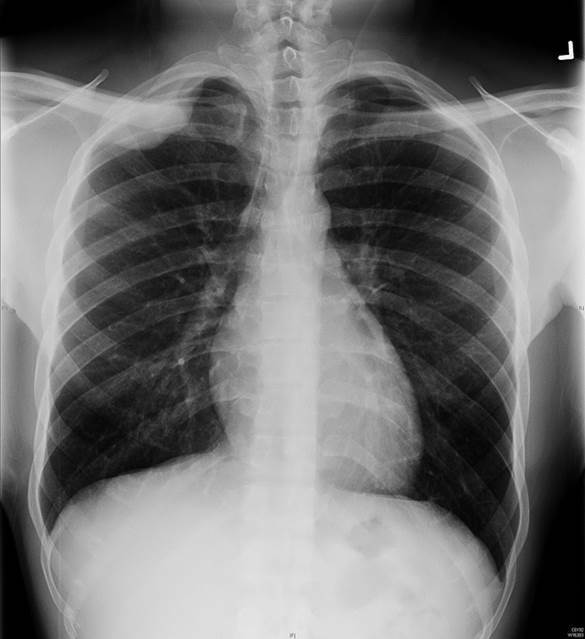 An x-ray showing the chest cavity. 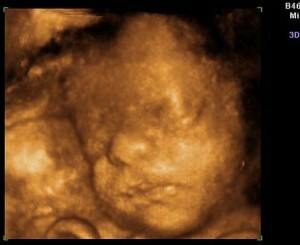 A 3D ultrasound scan of a baby in utero. An MRI of a human heart. No, not really. But high frequency sound – ultrasound – can be projected into the body, and by analysing the echo that comes back we can see things like organs or even babies. The great advantage of ultrasound is that its quick, safe, cheap (well, relatively), and gives real-time images of things moving, beating, pulsing or kicking. Getting more advanced, technologies such as MRI and PET scans can provide clear and tremendously detailed images of our organs, including the brain. Magnetic Resonance Imaging uses a strong magnetic field and radio waves to produce images. It’s particularly good for looking at neurons and muscle. Try out this game to learn more, from – of all places – the official Nobel Prize website. No, really. A Positron Emission Tomography scan uses positrons – a type of antimatter – to image the body whilst all the bodily functions are working away. This allows doctors to assess which bits are working correctly. Yes, the NHS routinely uses antimatter to help patients. As you’d expect, the Institute of Physics have more notes on MRI and PET scanning techniques. The applications are almost endless, and we’re only beginning to explore the possibilities. Want to kill a tumour? Ask a radiotherapist to blast it with radioactive isotopes. Need a motorised wheelchair? Ask a clinical engineer to design one which will be tailor-made to suit your exact needs. Want a prosthetic arm? How about one that you can control with your own brain? – see the film alongside. The Institute of Physics and Engineering in Medicine has some great videos about the range of different careers in medical physics. Here’s an introduction, which features a range of people working in the healthcare sector.